Does homework help your child to learn? On Friday we looked at research around homework in Primary School. We read the Education Endowment Fund's research which claimed homework in Primary School gives only modest improvements to children's learning. We are aware that homework can be a source of arguments and pressure in the home and would like to collect your thoughts on whether we should continue to set homework and if so what your thoughts are on the homework tasks. Mrs Ball and I have uploaded a survey onto the school PIOTA App that was launched last May. 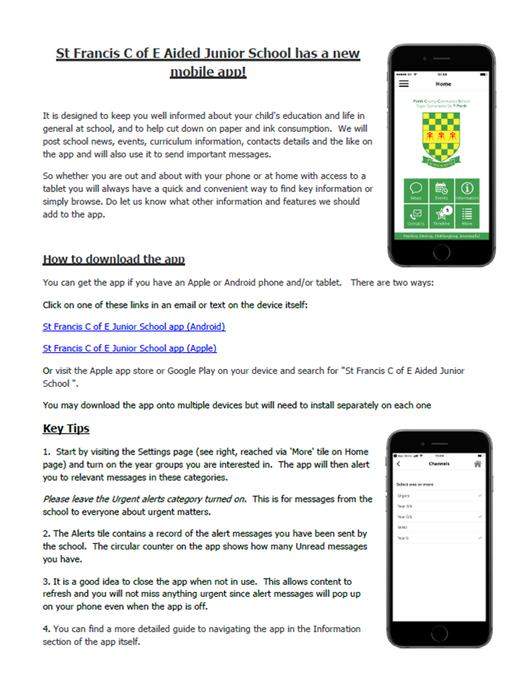 You can download it from the App/Google Play Store by searching for St Francis C of E Junior School. The questionnaire is under the 'Survey' tab. The How to Guide for our PIOTA App (pictured below) is located under the PARENTS / USEFUL LINKS section of our website.